My expectations were high for Iowa’s first state park and I was not disappointed. 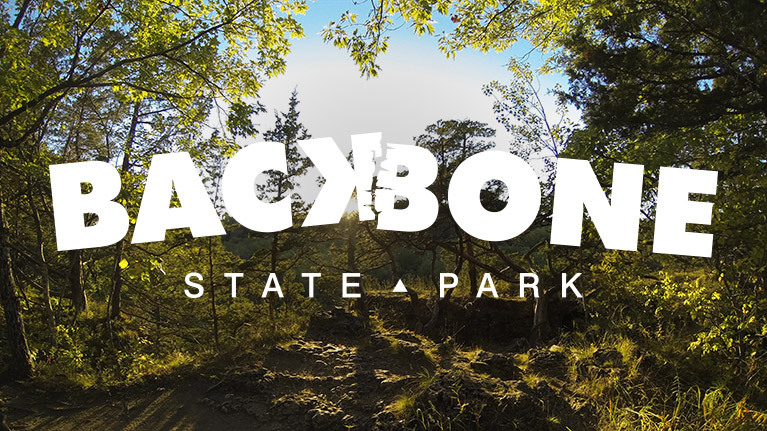 Backbone State Park & the adjoining Backbone State Forest have some unique activities to offer such as rock climbing, trout fishing, and rugged trail hikes. Rock climbing is one of the more intriguing activities, especially for Iowa, and Backbone State Park has some of the best climbing in the state. Climbers and repellers are asked to register at the park office. There’s no shortage of trout to be caught in the cool waters of Fenchel Creek. The 1.4 mile stream is feed by Richmond Springs and is located at the north end of the park. Easy access to Fenchel Creek plays a large part in the popularity of trout fishing at Backbone State Park. You can certainly find a secluded fishing spot or a handicap accessible location complete with wide parking and a sidewalk right up to the stream bank. Trout are stocked by the Iowa DNR hatcheries throughout the year and fish are abundant spring to fall. The Civilian Conservation Corps (CCC) built much of the parks infrastructure. Perhaps the most intriguing CCC project is an array of 16 round circles in a field behind a long stone wall that served as Iowa’s first trout hatchery. The hatchery was completed in 1925, but closed in 1987 due to insufficient water flow from Richmond Springs. A new hatchery was built east of Manchester, Iowa that allows for less expensive fish production. Other CCC structures such as the beach lodge, boat house, picnic shelters, auditorium, restrooms, bridges and dams are still in use today and help give the park its rugged charm. There is a CCC museum located within the park that spotlights the CCC’s contributions to Iowa’s parks. Backbone Lake was created by a CCC dam constructed on the Maquoketa River. The lake is available for swimming, boating and fishing. A sand beach and concession stand are located near the beach lodge and you can rent boats at the nearby boat house. Boat motors are limited to electric only on Backbone Lake and can be launched from the boat ramp near the dam. Backbone State Park has two campgrounds that provide 125 campsites total. Hiking trailheads are located in both campgrounds and it’s possible to start and finish a lake loop hike in either campground. The park staff does an excellent job keeping the campgrounds clean and tidy. Six Pines Campground is a primitive campground with 27 non-electrical sites. Located on the west side of Backbone Lake, It’s popular with dry campers, tent campers and climbers due to its proximity to rugged areas of the park. The grounds are spacious and level with many shady sites. There is no shower house at Six Pines, but two clean primitive restrooms are located within the campground with separate men’s and women’s facilities. Water spigots are available for fresh drinking water. Kids can enjoy the playground located in the center of the camp area. South Lake Campground is the parks modern camping facility on the southeast side of the park. Amenities here include: 49 electric sites, 49 non-electric sites, dump station, two shower houses, two primitive restrooms, and a playground. This campground is spacious with sites that can accommodate large RV’s or tent campers. Campsites are level with crushed stone pads. Sites on the northwest side have more shade than the southeast side. A few sites on the southeast end reveal a glimpse of Backbone Lake and are fairly shady. I enjoyed taking walks on the many South Lake campground roads in the evenings. The 16 cabins at Backbone State Park are some of the most popular in the state. They are booked up most weekends throughout the year. All the cabins are modern and have heating, air conditioning, kitchens, and bathrooms with showers. They also are equipped with futons or fold out beds for extra sleeping accommodations. Renters are asked to bring their own bedding and dinnerware. Each unit includes a fire-ring for campfires. There are many connector trails that lead from the cabins to the East Lake Trail. The trail system is a great way to access views of the lake and some of the more rugged areas of the park. There’s a nice variety of cabins to choose from. Cabins A, B, C & D are 2 bedroom handicap accessible units and all allow pets except for cabin A. These cabins allow a maximum of 6 people and are open year round. Cabins 1 – 8 are one bedroom family cabins with a maximum occupancy of four people. All allow pets except for cabin 8. These cabins are open April – October and closed in the winter. Cabins 9 – 12 are large two level handicap accessible units and are open all year. They can sleep up to nine people each and all allow pets except for cabin 12. These units also have nice decks, patios and outdoor spaces with glimpses of Backbone Lake. By Iowa State Park standards, the 9.83 miles trails at Backbone State Park are long and rugged. You’ll experience epic vistas, shaded timber hikes, marshy wetlands, shoreline lake walks, open prairie, heart pounding hill climbs and rugged rock hopping. The best way to experience the full gamut of what the park has to offer is to hike an approximately seven mile loop around Backbone Lake. Using a combination of East Lake Trail, West Lake Trail, Six Pines Trail and a little road trekking you can pick a starting point and make a day of hiking around the lake. If you’re looking for a shorter hike, try the popular Backbone Trail or Barred Owl Trail. Don’t forget about the trails on the north end of the park in Backbone State Forest. Trails in Backbone State Park are multi-use and open to hiking, cross-country skiing and snowmobiling. Hunting is not allowed in the park. On the north end of the park is Backbone State Forest. These trails are open to hiking, hunting, horseback riding and cross-country skiing. Snowmobiles are restricted from the state forest trails. This 3.2 mile route is the longest trail in the park and runs between the dam and Six Pines Campground. The trail is a well-worn path through dense timber. On the east end of the trail you will be walking along Backbone Lake above the shoreline. The west half of the trail is more rugged with some great views of the Maquoketa River valley. The West Lake Trail would make a nice up and back day hike from either campground. Six Pines Trail connects Six Pines campground with the Picnic Flats area of the park. It feels deceivingly longer than .68 miles because of the 50 foot elevation decent down to the Picnic Flats. This would make nice hike for families that want go to the picnic sites and playground in the flats area from the campground. There are also several popular rock faces that attract climbers down in the flats. Backbone Trail is the signature 1.1 mile trail in the park that traverses a rocky outcropping called the “Devil’s Backbone”. The views here are stunning and this route offers some of the best climbing in the park. The popularity of Backbone Trail is due to how accessible this unique terrain is to the public. A large parking lot is located at the trailhead of this lollipop style trail. It’s easy to park your vehicle and then start and finish your hike from the same trailhead. The 2.2 mile East Lake Trail is all about picturesque views of Backbone Lake. The east half of the trail follows the shoreline a few feet above the water level. This offers many good fishing spots along this section of the trail. The west half starts out high and gradually descends with a sheer rock wall on one side and the lake on the other. You could connect to the Bluebird Trail and make a nice loop hike. The two mile Bluebird Trail is a wildlife lover’s dream. This route is not busy and allows for many opportunities to observe various animals and birds. Bluebird Trail incorporates a two loop sections that wind through timber and prairie. Birders will appreciate the variety of birds to be seen in this route’s diverse habitats. Hike this .5 mile trail through some of the 6,000 trees planted by the Daughters of the American Revolution in 1928. You will see some spectacular views of the Fenchel Creek valley as well as a bird’s eye view of the old CCC fish hatchery below. The trail doesn’t really go anywhere significant in the park. You need to keep an eye open for the two trailheads on the side of the road. Each trailhead has a small parking area near-by. It would be best to pick a starting trailhead and double back when you reach the end. The 7.69 mile trail system in Backbone State Forest was initially a network of fire breaks to protect newly planted trees. The forest is now a mix of mature pines and upland hardwoods with a labyrinth of trails. The trails are 8’ to 10’ wide in most areas and are popular with equestrian riders. There are two roomy parking areas that can accommodate many tow vehicles with horse trailers. Hiking in the forest is pleasant and not too difficult. There are hills, water crossings, and some marshy areas but nothing very straining. The trails are simply long and winding which makes it easy to lose your bearings. Look for the unique stands of pine in the north half of the forest, wetter conditions with stream crossings in the middle and lush timber in the south. Horseback riding, hiking, cross country skiing and hunting are allowed in the forest. Hikers and skiers should yield to horses. All parties should be aware of each other especially during hunting seasons. Backbone State Park stands out as one of Iowa’s best state parks. It’s a well-established rugged place where families come for traditional outings and anyone can find a unique outdoor activity to indulge in. Rock climbing, hiking and trout fishing are the standout activates that make this park worth the drive. I’m glad you found it informative. Let me know how the trip went. Does anyone know how many people the Auditorium at Backbone State Park seats? My daughter would like to be married there, but no one at the number I called seems to know! SOS! Thank you!